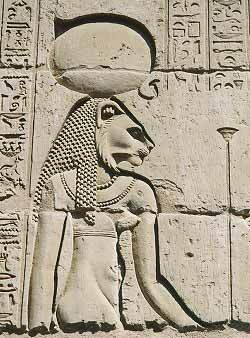 TEFNUT is the Egyptian Goddess of moisture. She and her brother-husband Shu, the God of Air, were created by the God Atum as a pair of lion cubs. Tefnut is the mother of Geb, God of the earth, and Nut, Goddess of the sky. She is depicted as a lioness-headed woman with a solar disk on her head, or sometimes as a lioness-headed serpent.